After the big hop bombs at Silver Moon and the chocolate sweetness of Afterschool Special, I was looking for something mild to finish off the night. 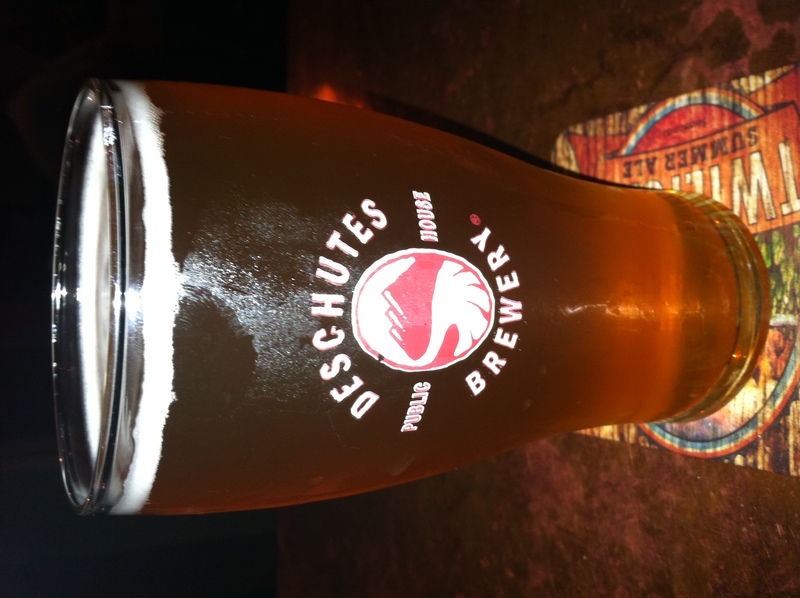 I decided a nice little American Pale Ale would be a great way to close out the night at Deschutes. Being that their Mirror Pond Pale Ale is so tasty I figured that their Spencer’s Gold would be equally as fantastic. Well, I was half right. Spencer’s Gold is a mild beer with 45 IBUs and a simple 4.5% ABV. You’ve heard of back-seat drivers, this is an instance of back-seat hopping. The bulk of Centennial and Cascade hop additions came at the end of the boil, creating substantial aroma and flavor for such a smooth and drinkable beer. This ale is filtered for your pleasure. Spencer’s Gold pours a delectable creamsicle orange. Head is a film with a bright white ring, which adds to the creamsicle look. Lacing splashes the inside of the glass, dripping down as the beer disappears. The nose on this beer is HUGE on fruit. Here’s the smell breakdown: tangelo, then grapefruit, then pine and finally some orange. It actually reminded me of those orange slice candies (the ones with the sugar sprinkled on them). The blend of fruity hops and piney hops is damn near perfect in this beer. Taste is a splash of spicy orange with a faint bit of grassiness…and that’s about it. There may be a hint of tropical fruit/grapefruit in the end, but it isn’t pronounced at all. Mouthfeel is just north of light. A mild stickiness is present that leads to some clinging. I was sooo disappointed by the taste of this beer. Spencer’s Gold has one of the best noses I’ve smelled in a long while, but the taste was just meh. After taking a whiff of that nose I was prepared for the best beer of the trip, sadly it was not the case. Maybe next beer.